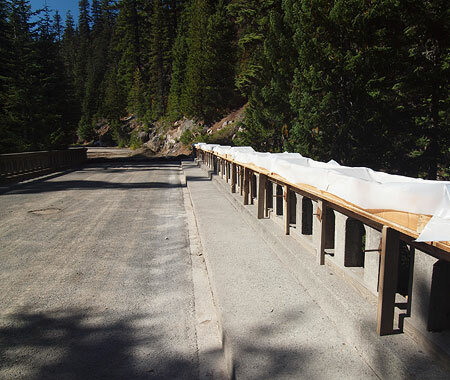 After years of delay and public agency wrangling, the long-awaited restoration of the East Fork Bridge at Sahalie Falls (henceforth simply called the “Sahalie Falls Bridge” in this article) began this summer. 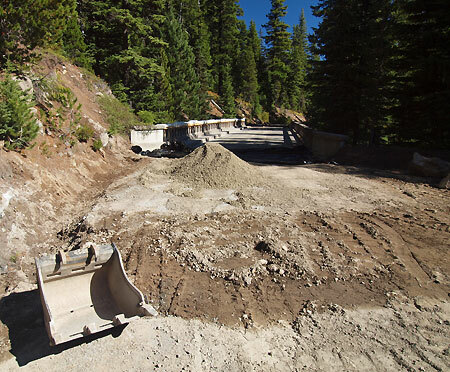 The project is advancing under a division of the Federal Highway Administration (FHWA) responsible for roads on public lands, and is scheduled for completion this year. 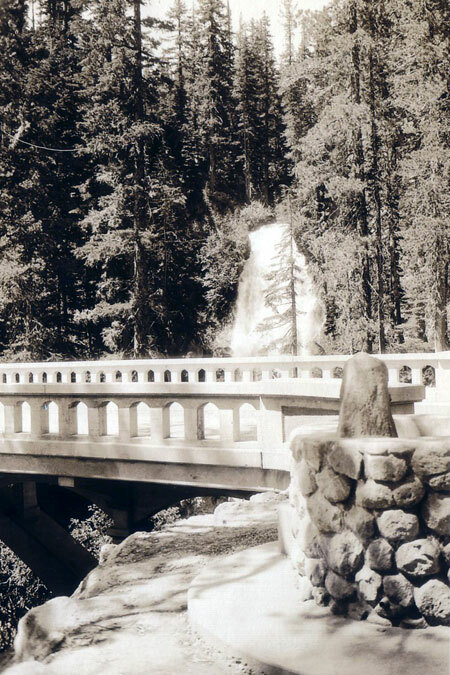 The Sahalie Falls Bridge was constructed as part of the final leg of the Mount Hood Loop Highway in the late 1920s. 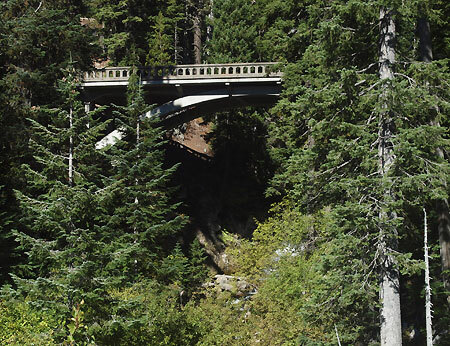 The bridge was completed in 1928, and is the most dramatic nod to the Samuel Lancaster’s Columbia River Highway on the Mount Hood portion of the loop highway. The structure was designed by federal lands bridge engineer H.R. Angwin as a graceful arch, spanning the East Fork directly in front of Sahalie Falls, with decorative railings and sidewalks built to allow travelers to stop and take in the inspiring views. 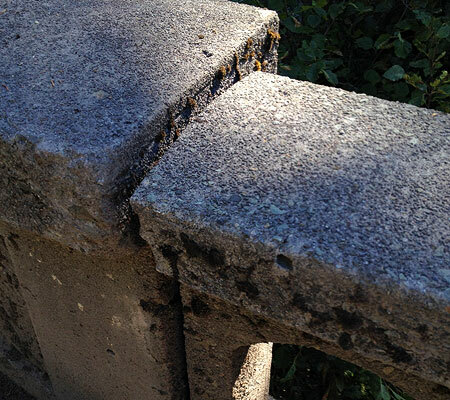 Complementing the idyllic setting is a cobblestone-faced drinking fountain, installed at the east end of the bridge. 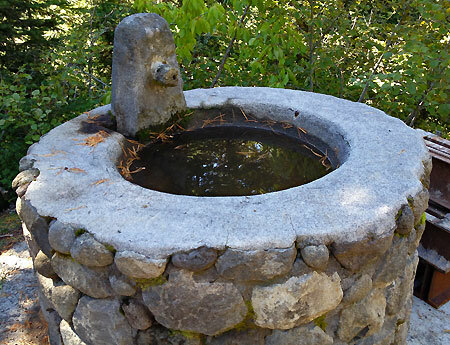 The fountain once provided a continuous supply of ice-cold mountain water to visitors, and was one of three original stone fountains placed along the Mount Hood portion of the old loop highway. The bridge carried loop highway traffic well into the 1950s, until the modern-day Highway 35 was built, bypassing this section of the old road. 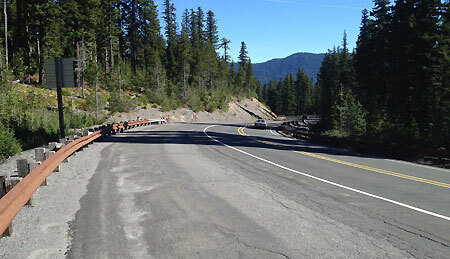 The new “straightened” highway not only deprived travelers of seeing Sahalie Falls, it also skipped the mountain views across beautiful Hood River Meadows, just east of the falls on the old road. Today, this bypassed section of the old highway remains open to the public (when snow-free) and will be drivable again once the bridge restoration is complete. 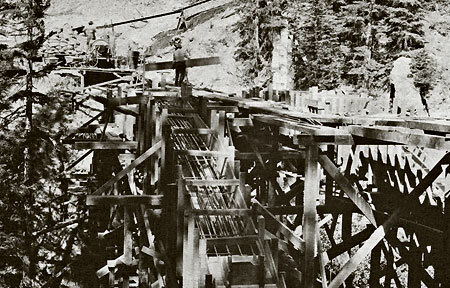 One of the mysteries of the old bridge at Sahalie Falls is the life of the designer and builder, Henry Raymond (H.R.) Angwin. Public records show him to be the Senior Bridge Engineer in the San Francisco office for the U.S. Bureau of Public Roads from the 1930s through the 1950s. Over the span of his career, Angwin designed dozens of bridges in the western states. In a picturesque setting of pink, Miss Neville Stevenson became the bride last night of Henry Raymond Angwin. Eighty relatives [witnessed the] ceremony read by Dr. John Stevenson and William Angwin. The bride wore a smart frock of white and silver with a conventional tulle veil and orange blossoms, and carried a shower bouquet of lilies of the valley. Her attendant, Miss [Mabel] Gustaffson, blonde as the bride is dark, was in pretty contrast to pink satin and tulle. The bride’s gown was taupe broadcloth with a chic taupe hat white fox furs accenting the tulle. Mr. and Mrs. Angwin [will] leave for an extended trip through the east, visiting the interesting cities en route. The bride is the daughter of Mr. and Mrs. A. V. Stevenson, whose home on Newton Street was the scene of the pretty service. Returning to Oakland, the young people will take an apartment in the Piedmont. H.R. 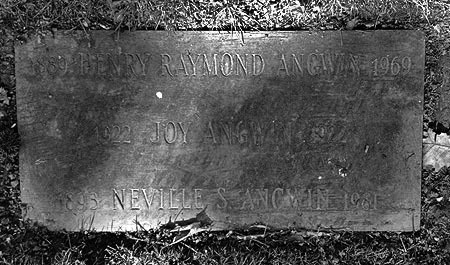 Angwin was born in 1889, graduated from Oakland High School in California in January 1907, and married Neville Stevenson ten years later, in 1917. They had been married 52 years when H.R. Angwin died in 1969. Neville Angwin died twelve years later, in 1981. The Angwins had at least two children, Joy and Robert. 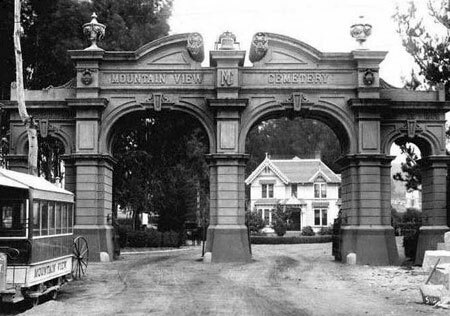 Joy died as an infant, and is buried at Mountain View Cemetery in Oakland with her parents. H.R. Angwin designed and built a number of familiar Oregon bridges during his tenure as a federal bridge engineer. The East Fork Bridge at Sahalie Falls was one of his first, completed in 1928. Two years later, Angwin designed and built the larger, and equally graceful Salmon River Bridge in Lincoln County. This hard-working gem also survives today, carrying heavy traffic on Highway 18 to the Oregon Coast. 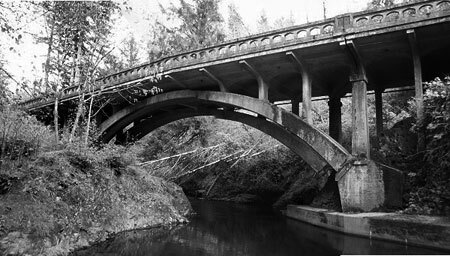 Several other Angwin bridges are scattered across Oregon, but most notable in the Mount Hood area are the steel truss bridges built along the Clackamas River Highway in the 1950s: Carter Bridge, Armstrong Bridge, Whitewater Bridge and Cripple Creek bridge all continue to carry traffic today. 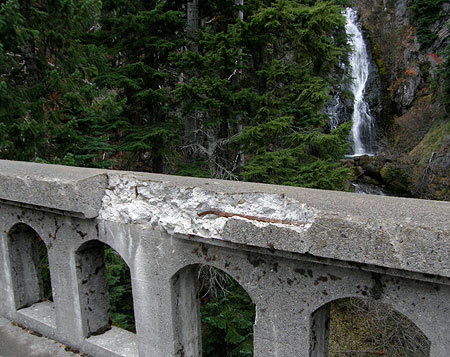 The Sahalie Falls Bridge had begun to show signs of serious deterioration by the late 1990s, and by the mid-2000s, whole chunks of the north railing were breaking loose — sadly, helped along by vandals pulling at the exposed rebar. 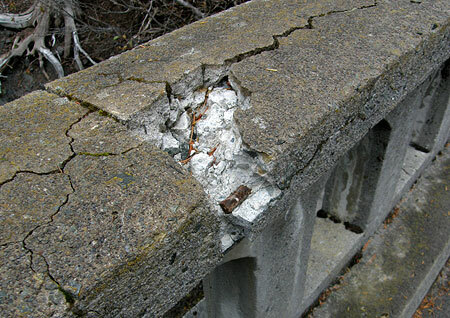 By 2008, the Oregon Department of Transportation (ODOT) had blocked vehicle access to the bridge, and a project was proposed in the state highway budget to restore the bridge. 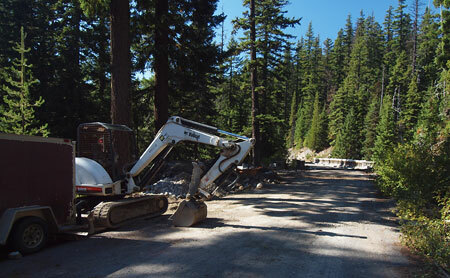 The original ODOT restoration project later evolved to become a FHWA project by 2011. The restoration focuses on three areas of needed repair: (1) rebuilding the approach abutments on both ends of the bridge, (2) replacing the heavily damaged north railing cap and (3) restoring the footing on the historic fountain at the east end of the bridge (there may be other repairs planned, but there is little information available for this project, so this list covers the repairs underway as of October of this year). Restoring the bridge abutments involves pouring new reinforced concrete footings at each end of the bridge span and improving surface drainage at the west end to direct storm runoff away from the bridge. The gravel pullouts at both ends of the bridge also appear due for grading and resurfacing as part of the project, as they currently serve as construction staging areas. A peek inside the railing caps (below) shows careful attention to original design details, including quarter-round trim along the outer edges. 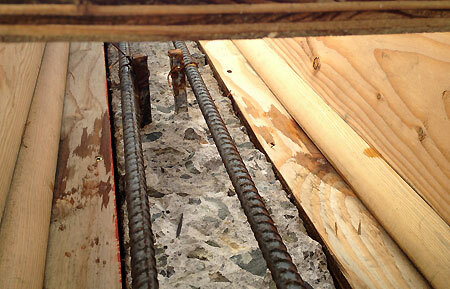 New reinforcing rods are wired to the original rebar posts embedded in the rails. When the new caps are poured, masons will use a screed (board) cut with a low arch to repeat the slightly curved top seen in the original cap. The plastic sheeting attached to the forms will be secured over the newly poured caps to slow the curing process to ensure a strong set. 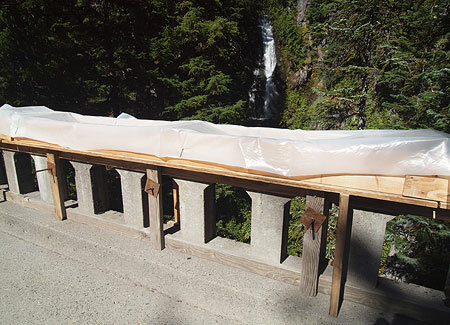 The third element of the Sahalie Falls Bridge project is replacement of a portion of the concrete footing that supports the historic cobble-faced fountain. In the 2009 photo (below) you can see where a section of the fountain base facing the East Fork (behind the fountain) had sunk toward the creek over time, threatening the stability of the fountain. The bowl and rim of the old fountain were restored at some point in the more recent past, and are not part of the current project. 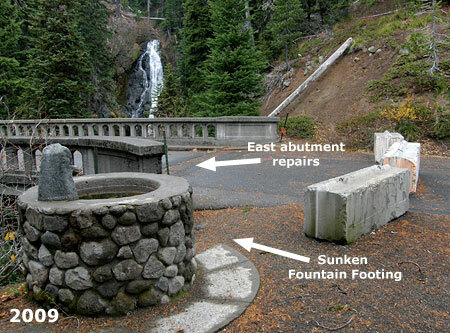 The fountain is one of three that survive along the loop highway. 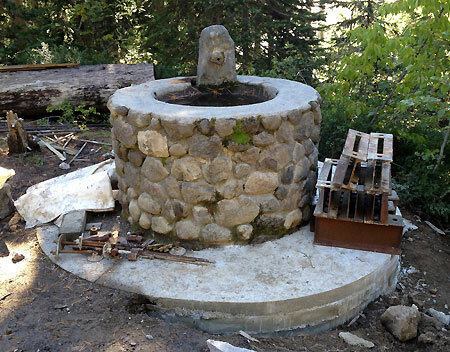 The fountain at Buzzard Point still functions, while the fountains at Sahalie Falls and Sherwood Campground (below) are no longer operational and simply serve as rain basins. 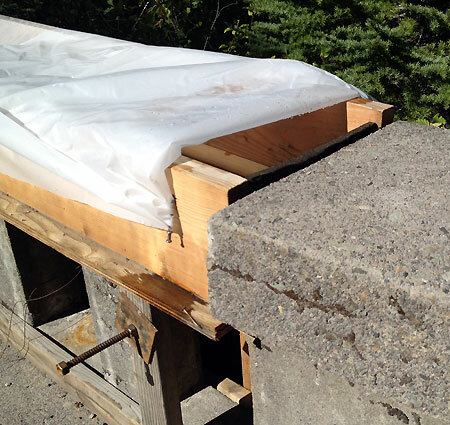 Crews saved this piece of the old fountain footing — perhaps to be repurposed as a bench? Once the restoration project is complete, the Sahalie Falls section of the old loop will re-open to traffic. For the past decade or so, the route has been signed as one-way at the west end, where it connects to the Bennett Pass interchange, so the best way to explore the old highway is follow the signs to Hood River Meadows, then turn left onto the old road before reaching the Meadows resort parking. Now that the restoration work is finally underway, the stage is set for some much-needed visitor improvements to the Sahalie Falls area. The view of the falls from the historic bridge is missed by too many travelers, and the odd near-miss with the Umbrella Falls trail (just 100 yards from the bridge, but with no trail connection) has resulted in some messy boot paths formed by hikers attempting to see Sahalie Falls. This proposal would address both issues, and make it easier to visit the old bridge and falls, whether as a spur from nearby hiking trails, or simply by pulling off Highway 35. 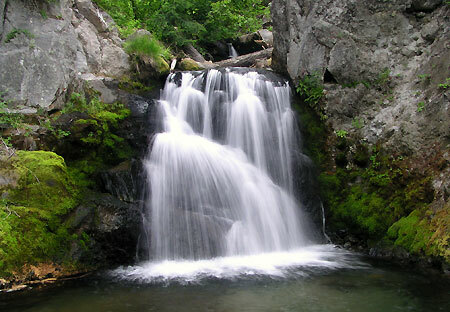 The first part of the proposal is a short hiking spur from the bridge to the nearby Umbrella Falls Trail. This would be a very simple trail to build, and could easily be constructed by volunteers. It would not only provide a safe way for hikers to view the falls, but would also allow for the various boot paths along this slope to be decommissioned, and some of the trampled vegetation to be restored. The second part of the proposal is an accessible loop trail that would allow the elderly, disabled and families with small children to experience the East Fork in a new way. The trailhead for the new loop would be at the east end of an existing pullout on Highway 35, where the historic highway bridge can be seen from the modern loop road. 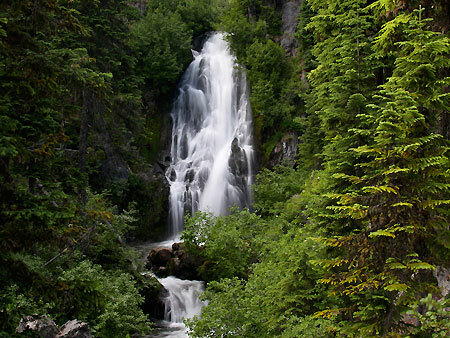 The first leg of the new loop trail would follow the East Fork to the base of little-known Lower Sahalie Falls, a charming waterfall hidden in the canyon beneath the historic bridge. From here, the new accessible loop trail would cross the East Fork in front of the lower falls and gently traverse up the west slope of the canyon to the west bridge approach. 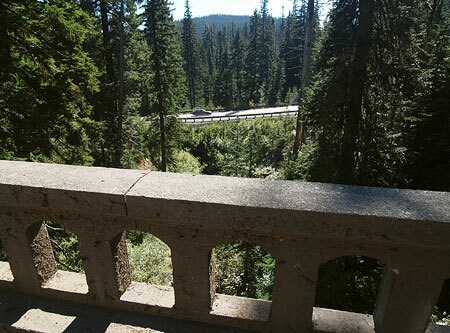 Once at the old highway grade, the new path would cross the historic bridge, providing a view back to the trailhead pullout on Highway 35. Visitors to the bridge inevitably cross to admire the views from both sides, so an accessible route would probably warrant a marked crossing at the two bridgeheads, where people using mobility devices could most safely access the sidewalks. After enjoying the views from the bridge, visitors would continue past the east end to a resumption of the new loop trail, following the east leg back to the trailhead. 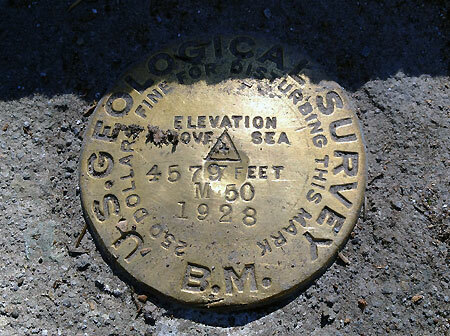 The total distance of the accessible loop would be about 0.3 miles with a very modest elevation gain of about 60 feet. Accessible trails are often paved, but for this new route, a better option would be fine gravel, mostly because it would provide better traction in an often wet environment. But the proposed loop is also within the deposit zone for winter highway snow removal that sends a lot of grit used to sand icy roads far into the adjacent forest. 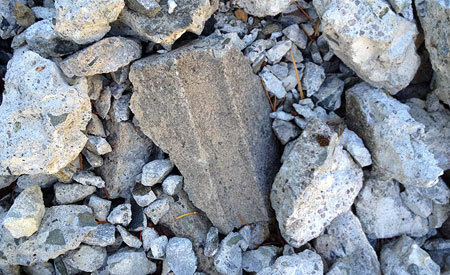 A gravel trail surface could actually be enhanced by these annual deposits, where a paved surface would require sweeping to remove winter gravel. 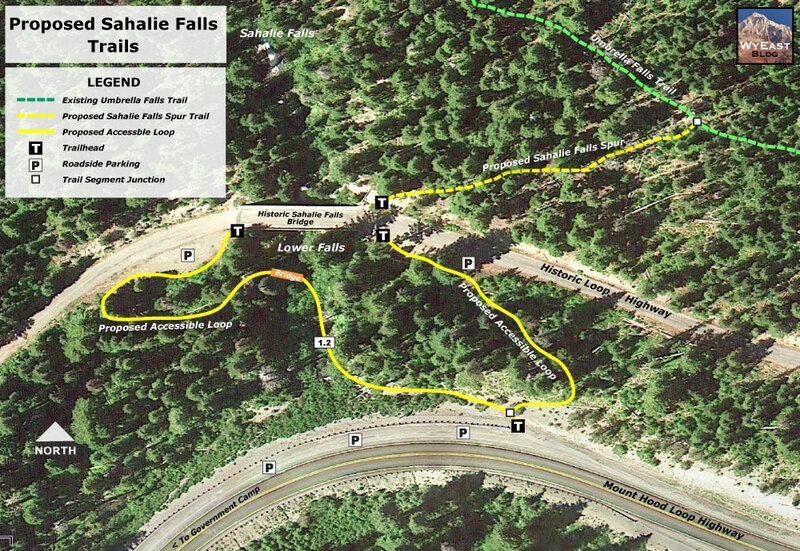 As with all proposals in this blog, the Sahalie Falls accessible trail concept relies on the U.S. Forest Service — and in this case, Oregon Department of Transportation — acknowledging the need for more recreational and interpretive opportunities in the Gorge and on Mount Hood. 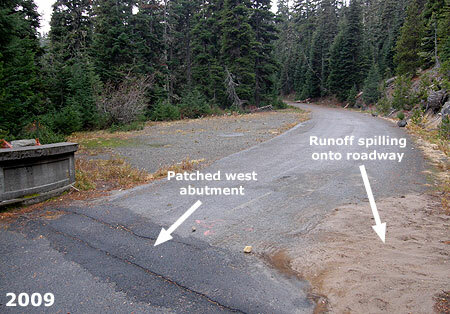 While the proposed spur connection to the Umbrella Falls trail could be built by volunteers, the proposed accessible loop trail would be a major endeavor that could only be accomplished by the Forest Service in conjunction with ODOT. The added twist in this proposal is the need for an accessible trail, something in very short supply in our region despite a rapidly growing elderly and disabled population. 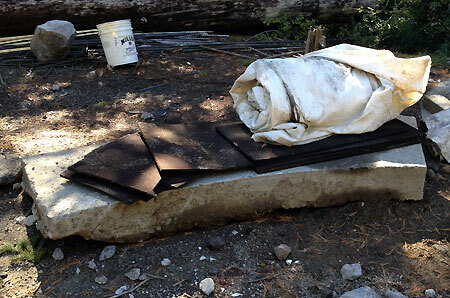 Oregon State Parks and Recreation has made great strides in responding to this need in recent years, but the Forest Service lags behind badly, with few accessible facilities built in the last 30 years. 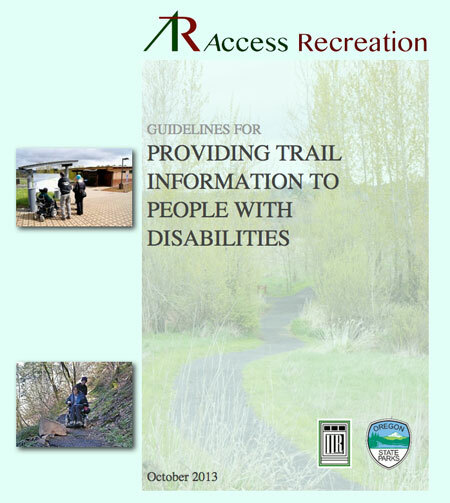 Fortunately, a new guide for designing accessible trails has recently been developed by the Access Recreation project, an ad-hoc organization formed to develop better design guidelines for public agencies involved in trail-building. The guidelines are now available on the Access Oregon website, and cover everything from trail surface and slope recommendations to best practices for signage and trailside amenities that address the needs of elderly and disabled trail users. It’s a great resource for trail advocates and public agencies, alike — and could help shape new trail options on Mount Hood!